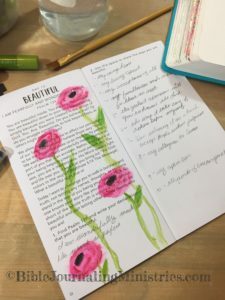 I’ve done some really fun Bible Journaling entries in the books of Joel, Psalms, 1 Kings, 1 Timothy, Ecclesiastes, Song of Solomon, and Titus this past week. Don’t be afraid to try new techniques. I put in a little extra effort and used some different ideas in these entries and it really paid off. I’ve provided links to supplies if you’d like to support our ministry with your purchase. 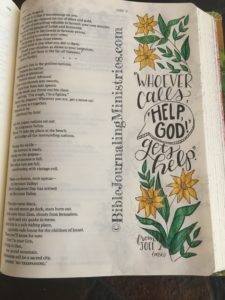 I don’t often do Bible Journaling entries in the book of Joel, so I wanted to make this one special. It comes from my Canvas Bible and uses Glitter Gel Pens. 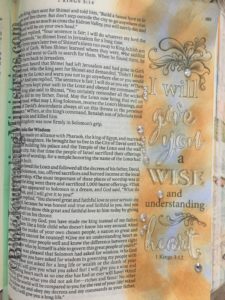 For this Bible Journaling entry in the book of 1 Kings, I added a few fun extras. I worked in the Inspire Bible and used Gelatos and crystal bling. 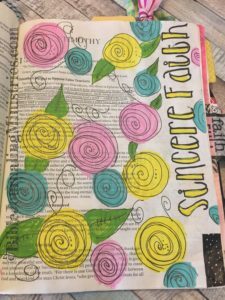 How cute is this Bible Journaling entry from the book of 1 Timothy? I went with acrylic paint doodles and the Big Words Faith Traceables available in our store for this one. 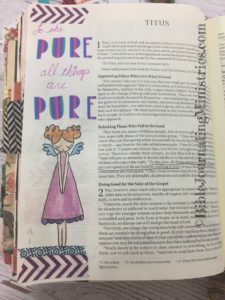 I love adding illustrations to Bible Journaling entries like I did here in the book of Ecclesiastes. This one uses a standard Bible, colored pencils, and Your Beautiful Word Traceables available in our store. 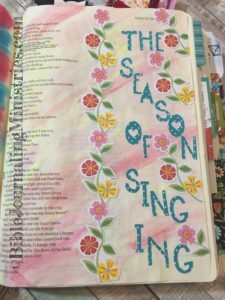 I made the most of some extra space for this Bible Journaling in the book of Song of Solomon. It’s accented with cardstock stickers. 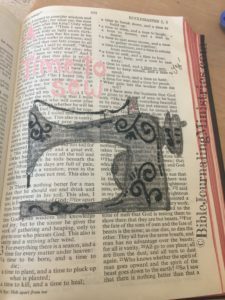 As the month is winding down, I’ve done one more Bible Journaling entry from the day’s Calendar Bible Verse in Titus. For this adorable one, I used Greeting Farm Stamps and Pencils.